OfficeSIP Messenger provides enterprises with advanced instant communications for free. It supports text, voice and video chats, the free softphone implements ICE, STUN, and TURN protocols to easily traverse NAT and firewalls, and supports TLS for ultimate communication security. 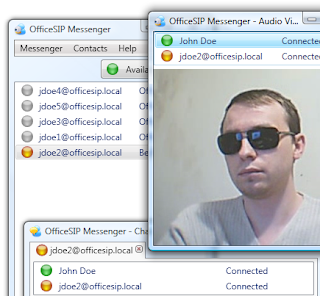 OfficeSIP Messenger is based on industry-standard libraries used by Microsoft Office Communicator. It ensures the highest level of compatibility with audio clients and Web cameras, and provides landline-quality calling for both voice and video. Unlike other enterprise instant messengers and communicators, OfficeSIP Messenger is entirely server-based, allowing administrators to enter, store and modify all settings, configurations, and user profiles on a corporate server. IM users will benefit from a single sign-on after logging in to the corporate domain. Active Directory support allows the IM system getting information about the users directly from the server’s domain controller.